Welcome to live coverage courtesy of The Independent of the Barclays Premier League meeting between Watford and Crystal Palace. Quique Sánchez Flores' Hornets will be satisfied with their start to life back in the top flight after consecutive wins over Swansea City and Newcastle United propelled them up the table. Palace, meanwhile, are looking to recover from two quick-fire defeats to Manchester City and Tottenham Hotspur despite still being buoyed by that remarkable 2-1 win over Chelsea three weeks ago. Stay tuned for team news from Vicarage Road as we react to yesterday's action - which included wins for Manchester United, Arsenal, Spurs, Southampton and Stoke. When Jamie Vardy left Per Mertesacker trailing as if running in treacle to put Leicester ahead this looked as if it would be another difficult afternoon for Arsenal, writes Glenn Moore. Alexis Sanchez finally shook off his Copa America hangover to propel Arsenal above Leicester in the table and within three points of the Premier League summit. 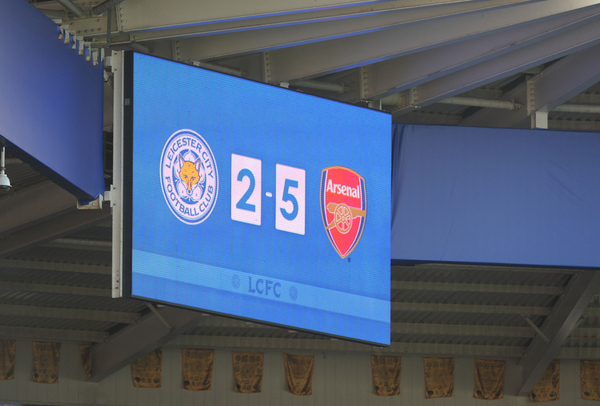 Sanchez scored his first goals of the season, and his first Arsenal hat-trick, as Leicester were defeated for the first time this campaign despite a brace from Vardy, England’s most in-form striker. With Theo Walcott and Olivier Giroud also scoring Arsenal’s early-season problems in front of goal may be over. 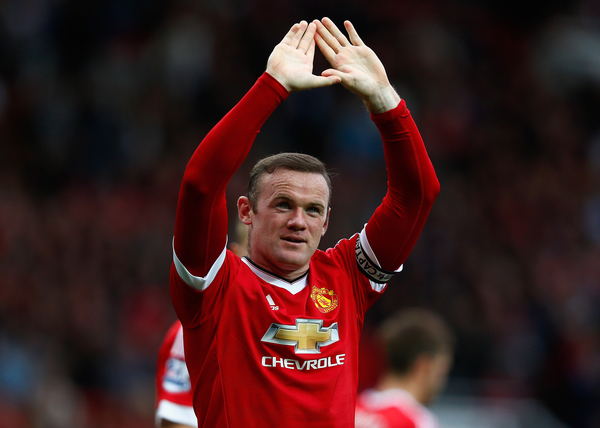 Wayne Rooney helped Manchester United deliver a serious Premier League title warning to neighbours Manchester City by finally ending the longest goalscoring drought of his career. After 11 matches without finding the net in the League, Rooney took just 39 seconds of the second half to add to Memphis Depay’s opening goal four minutes into added time at the end of the first half to see off Sunderland. While the £36m Anthony Martial missed out on scoring for the third game in a row, Rooney’s goals took him level with Denis Law in United’s list of all-time scorers by hitting the 171 mark. Stoke belatedly registered their first win of the season, while promoted Bournemouth’s prospects suffered a major blow as top-scorer Callum Wilson joined summer signings Max Gradel and Tyrone Mings in the treatment room, writes Jon Culley. Wilson, who hit 20 goals in the Championship last season and already has five in the top flight, was injured in a ninth-minute challenge by Stoke’s Philipp Wollscheid, who could not be blamed for what happened. The 23-year-old former England Under-21 striker attempted to continue after lengthy treatment on the field but collapsed in pain as soon as he tried to run. West Ham’s final season before decamping to the Olympic Stadium is clearly going to be one of ups and downs. This one sat somewhere in the middle, thanks to Cheikhou Kouyaté’s equaliser in added time when a third home defeat in four matches was looming. So after an extraordinary trio of away wins at Arsenal, Liverpool and Manchester City, an afternoon that began with talk about the combination of results that would have put them top of the table left Slaven Bilic’s side grateful for a point at home to Norwich to keep them in third place. 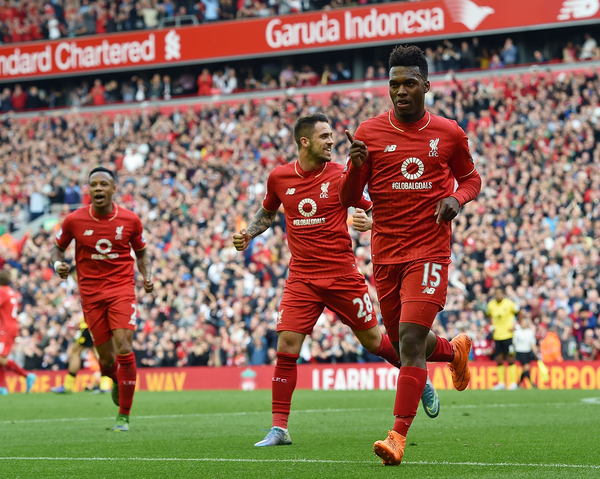 For Brendan Rodgers, this may have been a stay of execution or it may be a turning point but, whatever it was, this was far and away Liverpool’s best performance of a fraught start to the season, writes Tim Rich. Whether this win, full of fine forward play and dreadful defending, puts an end to the crisis, only time will tell. Liverpool’s next game is the Merseyside derby and Rodgers (pictured) is under no illusions. 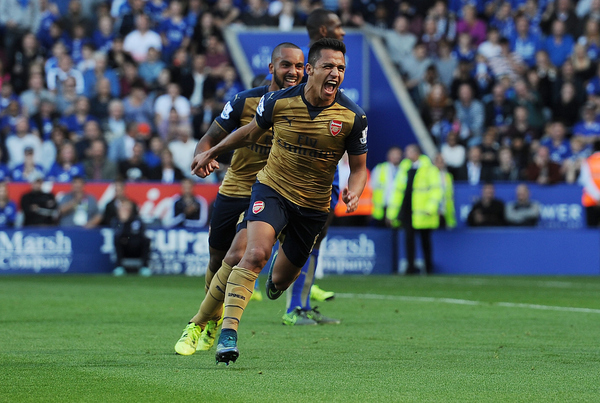 Almost exactly 12 months ago to the date, Alexis Sanchez announced his arrival on English football with a goal which secured a 1-1 draw against yesterday's victims Leicester City. It may have taken £35m to secure his services last summer, but it has been worth every penny of Arsene Wenger's precious Emirates Stadium reserves after this stunning hat-trick saw off the Foxes. The former Barcelona man’s first strike of the afternoon was a masterclass in the art of counter-attacking, something Leicester can consider themselves to be connoisseurs in, but his second and third were simply stunning. 5 things we learnt from the King Power Stadium. What was most damning about this Manchester City performance – and there was a long list of things – was the speed of their collapse, writes Jack Pitt-Brooke. They were 1-0 up in the last minute of the first half, not playing especially well but hoping to dig in and see out an important win. Five minutes after the restart they were 2-1 down and the game was obviously gone. City conceded another two in a second half that was reminiscent of the second-half surrenders of last season. This was the day when City slipped from the top of the Premier League. They will need to rediscover their character if they want to get back up there. Crisis averted. Jose Mourinho says he does not hold with the ‘c’ word, but even he must be reconsidering that opinion as Chelsea stared a fourth loss in seven Premier League games in the face. Newcastle, unrecognisable from the shower that lost in the League Cup to Sheffield Wednesday, led through goals from Ayoze Perez and the vivacious Georginio Wijnaldum and with 11 minutes left, Chelsea were flat and, apparently, beaten. Then substitute Ramires belted in a piledriver and eight minutes later another substitute Willian delivered a free-kick that flew over everyone and past Tim Krul. Ronald Koeman showed just how tough he is to please by criticising his Southampton players following a convincing win over Swansea, writes Andy Sims. The Saints’ perfectionist manager rapped his players for giving Swansea a glimmer of hope through Gylfi Sigurdsson’s late penalty. Virgil van Dijk, the £13million deadline-day signing from Celtic, powered in a header from James Ward-Prowse’s corner to give them an 11th-minute lead. Dusan Tadic doubled the advantage shortly after half-time when he latched onto Graziano Pelle’s clever ball and his angled shot was deflected in.. Crystal Palace manager Alan Pardew is in a bullish mood ahead of this afternoon's clash with Watford. 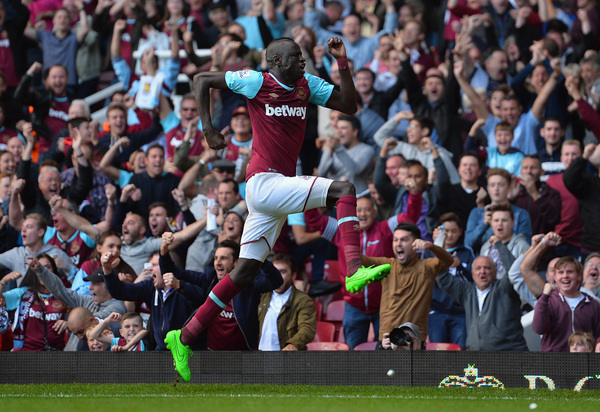 "We've got a lot of pace in the team, which makes us dangerous away from home," he told BBC Sport. "I don't think anybody had six more difficult [opening] games than us and to take nine points is great. "We're not getting carried away with our ambitions. We think we can challenge for a Europa League spot if we have a good first half of the season." Odion Ighalo, the highest goalscorer in English football in the calendar year, continues up front for Watford after inspiring them to victories over Swansea City and Newcastle United. 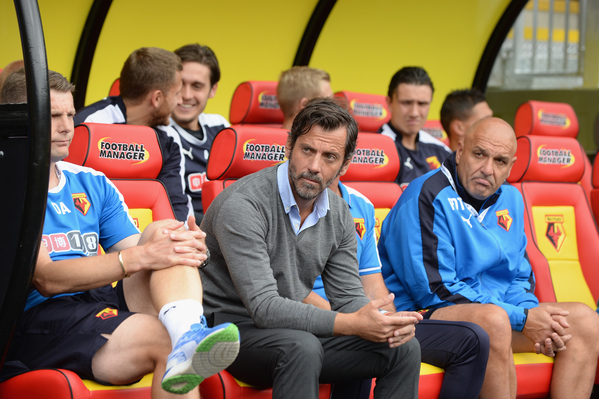 Hornets boss Quique Sanchez Flores keeps the faith with goalless Troy Deeney alongside the Nigerian in attack. 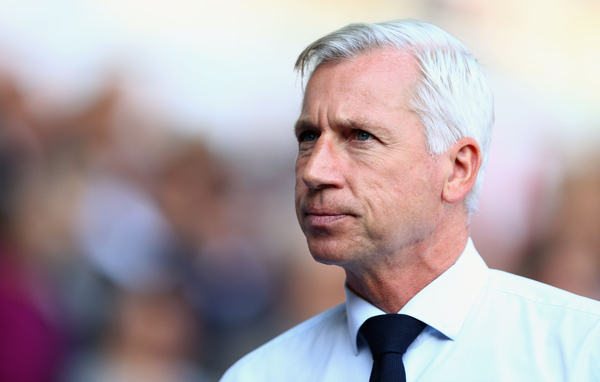 Alan Pardew, meanwhile, has James McArthur and Wilfried Zaha on the bench should the likes of Jason Puncheon, Bakary Sako and Yannick Bolasie fail to fire them to victory. 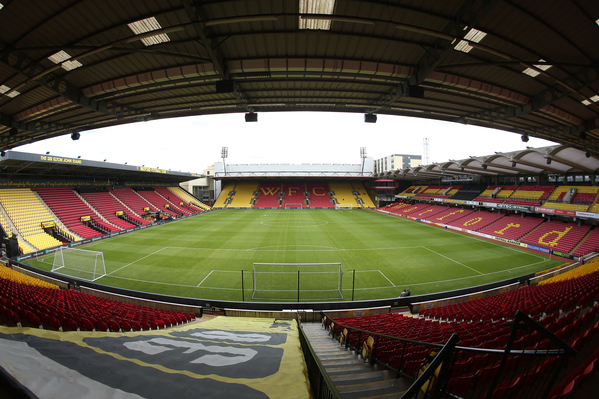 Watford: Gomes; Nyom, Cathcart, Prödl, Anya; Capoue, Watson; Abdi, Deeney, Jurado; Ighalo. Subs: Arlauskis, Paredes, Ake, Guedioura, Ibarbo, Berghuis, Diamanti. Crystal Palace: Hennessey; Kelly, Dann, Hangeland, Souare; Ledley, Cabaye; Puncheon, Sako, Bolasie; Gayle. Subs: McCarthy, Croll, Mariappa, McArthur, Zaha, Gray, Campbell. Watford head coach Quique Sanchez Flores has called for respect from his players as they prepare to welcome Crystal Palace to Vicarage Road. 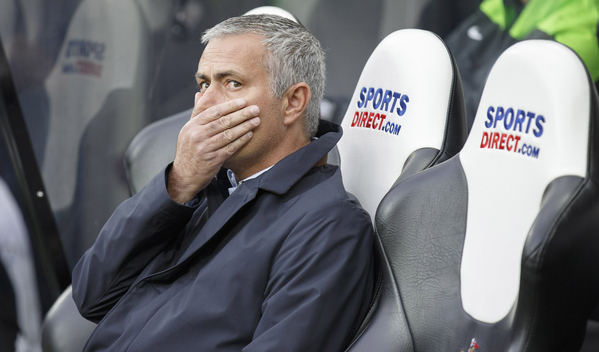 "We feel confident but we must respect Crystal Palace," he told BBC Sport. "They have achieved very good results away from home. "Crystal Palace are very quick offensively and have players who are very clever at using space. They will come with a high spirit so if we want to win we will have to play very well." 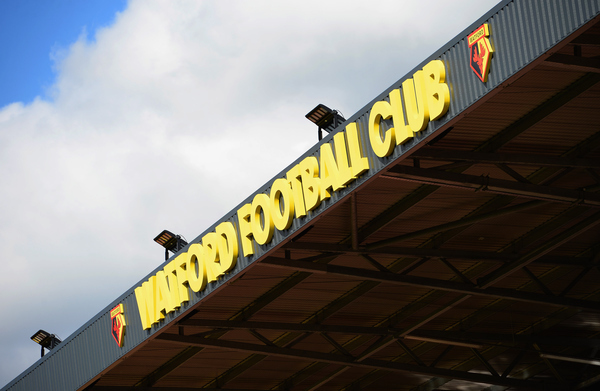 Watford are bidding to win three successive top-flight games for the first time since April 1987 and Quique Sanchez Flores has reason to be optimistic with his side yet to concede at home. However, while this may be the first Premier League meeting between the pair, the Hornets have only won one of their last nine home league games against Crystal Palace. Prior to this weekend's set of fixtures, only Stoke City shot-stopper Jack Butland (33) had made more saves than Palace keeper Alex McCarthy (29) in the league this season. Wayne Hennessey starts in his place today. 3 mins - Watford 0 Crystal Palace 0: After a direct start from the Eagles, which saw Yannick Bolasie gallop at Heurelho Gomes' goal straight from kick-off before firing wide, Watford settle. Étienne Capoue fires wide from distance. 12 mins - Watford 0 Crystal Palace 0: Yohan Cabaye plants an exquisite free-kick onto the head of Brede Hangeland but the 34-year-old Norwegian's header is straight at Heurelho Gomes. 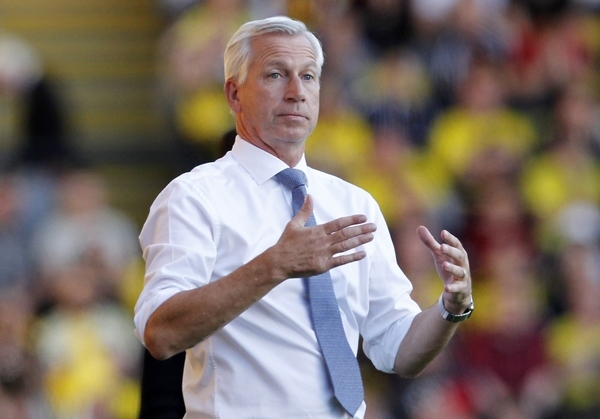 Big chance for Alan Pardew's men. 17 mins - Watford 0 Crystal Palace 0: Yohan Cabaye elects to shoot this time - from a free-kick in a similar area to his last - but the wall does its job. The ball falls to Jason Puncheon, mind you, but the 29-year-old's low drive flies wide. 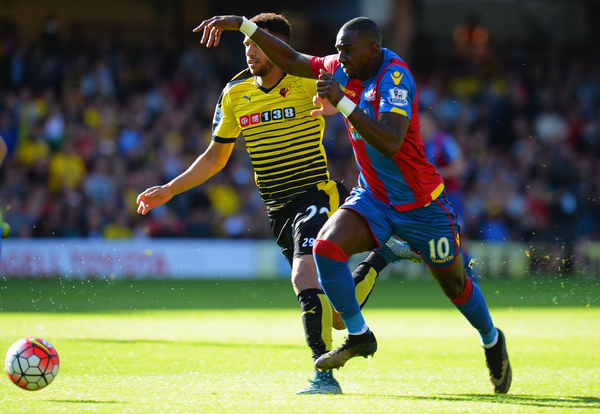 24 mins - Watford 0 Crystal Palace 0: It would be a safe bet to say that the result of the battle between Yannick Bolasie and Allan Nyom will decide this fixture. The pair have been at each other's throats so far - with the Hornets man just about coming out on top. 31 mins - Watford 0 Crystal Palace 0: Bakary Sako is enduring a difficult afternoon so far and watches his latest effort glide wide of the Hornets net. While Palace will be content with their start, they don't yet look like becoming the first side to score at Vicarage Road this season. 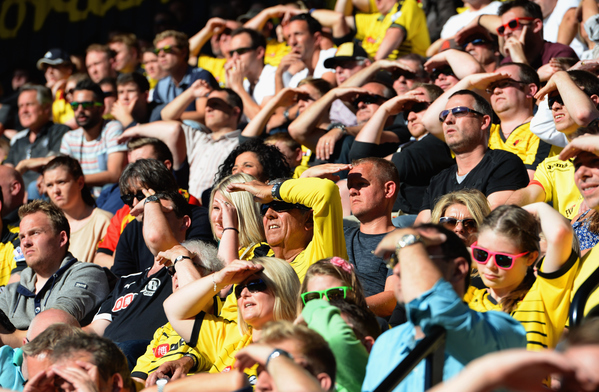 38 mins - Watford 0 Crystal Palace 0: Almen Abdi sees his name go down in the referees book. 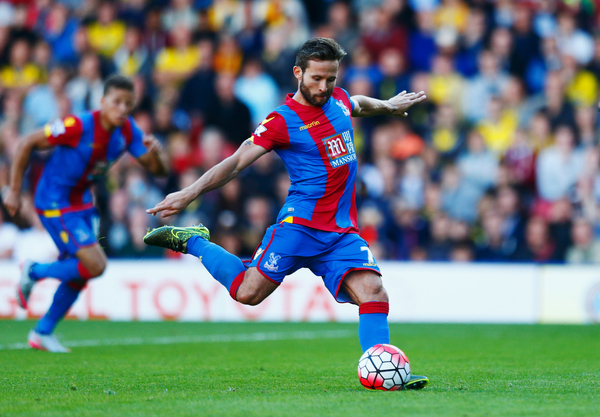 As was the case on the last two occasions, however, Yohan Cabaye's free-kick came to nothing. 42 mins - Watford 0 Crystal Palace 0: Almen Adbi's boot coming off is perhaps the most exciting thing to have happened in about 20 minutes. Go get the kettle on. As a half which started promisingly comes to a close, it's difficult to ignore the fact that neither goalkeeper has been called upon to make a major save. Both managers will expect an injection of pace in the second period. 45 mins - Watford 0 Crystal Palace 0: The action has restarted at Vicarage Road but it'll take more than Watford's trademark resilience to break down this most stubborn of stalemates. 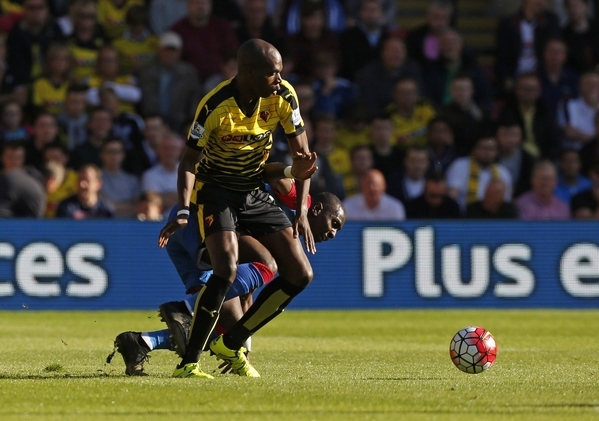 46 mins - Watford 0 Crystal Palace 0: That is exactly what the match needed! José Manuel Jurado curls his free-kick onto Wayne Hennessey's crossbar before watching it thunder away to relative safety. Palace have been warned! 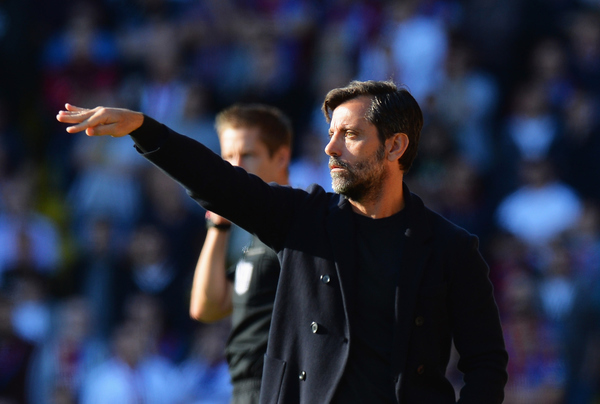 52 mins - Watford 0 Crystal Palace 0: As the match returns to the tedium of the first half, let's just take a moment to observe the fashion choices of Watford boss Quique Sánchez Flores. 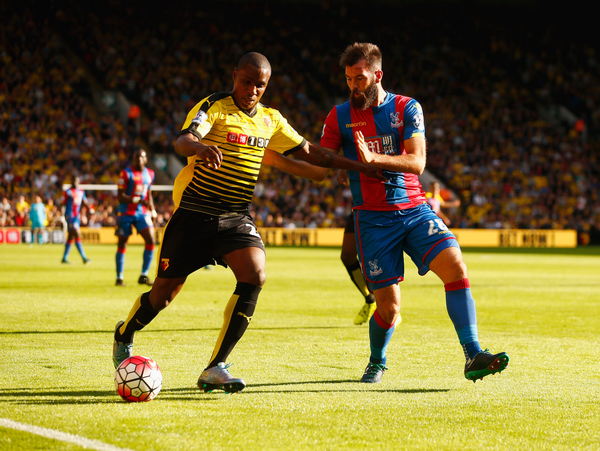 54 mins - Watford 0 Crystal Palace 0: The ball is launched towards Odion Ighalo who plays it into the path of Almen Abdi. The Swiss international unleashes a fierce effort but Wayne Hennessey was on hand to push it wide. 59 mins - Watford 0 Crystal Palace 0: Bakary Sako delivers the cross of the match straight into the path of Dwight Gayle but the former Peterborough United man rattles the crossbar. Alan Pardew's men are getting closer! 67 mins - Watford 0 Crystal Palace 0: The stalemate relents despite the best efforts of Wilfried Zaha down the left flank. Alan Pardew's men have looked a different proposition since the former Manchester United man was introduced. Allan Nyom hauls Wilfried Zaha to the floor inside the area! Yohan Cayabe to take..
71 mins: Heurelho Gomes is desperately unlucky not to get a hand to it but Yohan Cabaye's penalty is just too good (and too high) for the Brazilian goalkeeper to reach. 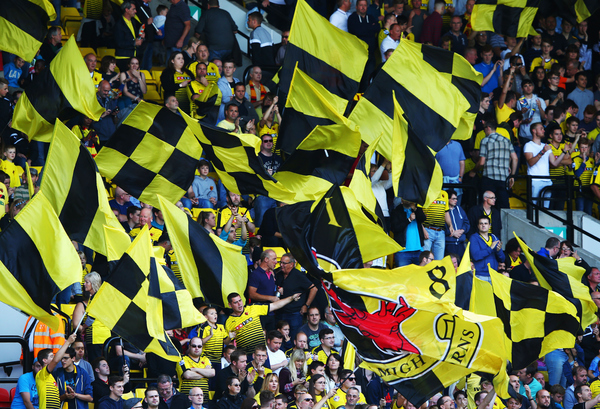 That's the first goal Watford have conceded at home this season. 80 mins - Watford 0 Crystal Palace 1: Despite the best efforts of their supporters, the hosts are struggling to mount a serious assault on the Palace goal. Alan Pardew's men have needed the desperate defending of Brede Hangeland and Joe Ledley on occasion, but they are keeping the Hornets out. 84 mins - Watford 0 Crystal Palace 1: Dwight Gayle is found in acres of space, behind every Watford defender in sight, but the forward fires just wide after a moment of dithering on the edge of the box. Yohan Cayabe was the hero in an otherwise drab affair as Watford lost at home for the first time of the season. The Hornets drop to thirteen in the Premier League while Crystal Palace climb above Leicester City to sixth. 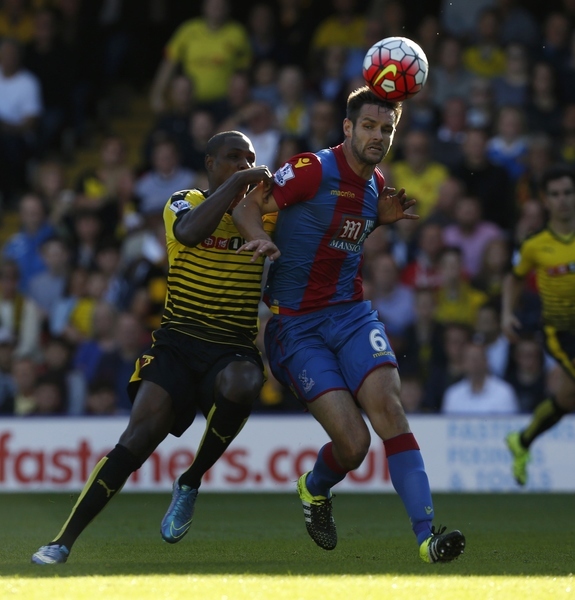 Scott Dann speaking at full-time to BBC Sport: "We knew it would be tough today so we are delighted. We deserved more from our last two games. 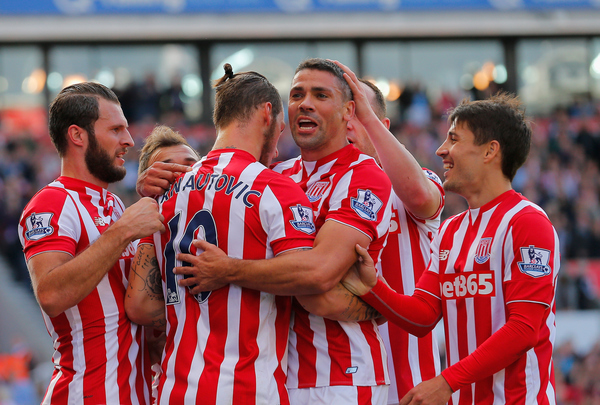 "We had to grind it out and it was our first clean sheet of the season." Quique Sánchez Flores believes Watford were unlucky to lose to Crystal Palace as Yohan Cabaye's penalty gave the visitors the points. He said: "There was not much difference between the two sides today.It was difficult to stop their attack, it was uncomfortable for us. We need to open up the pitch more. "We did not stop the counter-attack, we were disorganised. It was a very big decision from the referee to decide the match. I am not sure." Alan Pardew was delighted by the way Crystal Palace saw off Watford despite their hosts' defensive strengths. “Sometimes as a manager you want a performance that lifts you – the back four were terrific and didn’t give Watford too much daylight," he told Sky Sports. "Down the sides our wide players caused trouble and we got ourselves a great win in a tight game. We’ve lost two tight games, so a win makes up for the games where the margins cost us. “I thought Wilfried Zaha did very well against Charlton in midweek, and then today fresh coming off the bench he caused a problem because he’s got that determination to prove me wrong – and I like that.